It is hoped that this Catalogue, which is issued as a part of the Harvard Exhibit at the World's Fair, may prove useful in various ways. It attempts to give information about the equipment of psychological laboratories, to spread a more exact kllowledge as to the purpose of Experimental Psychology, and to give an account of the opportunities offered to students at Harvard. Our Laboratory, which occupies tile second story[sic] of Dane Hall, has been but recently established, and therefore our Catalogue is of necessity merely provisional. Nevertheless, the outfit is, even now, the most nearly complete that is anywhere at the disposal of students in psychology. It is adapted both to the courses in demonstration and exercise for beginners, and to original research by advanced students. The need of explaining to larger circles the purpose of Experimental Psychology arises from the fact that many misapprehensions still exist, and should be corrected. Experimental Psychology is too often confused with experiments upon the brain by by vivisection, with hypnotism, and even with spiritism. To counteract these misunderstandings and prejudices, there is given, not only a descriptive list of our instruments, but also, in appendix A, a list of the original researches conducted in our Laboratory during the present year. This account of our experiments may also serve to correct the error, which is so prevalent, that Experimental Psychology is confined to the study of sensations and simple reaction-times. Association and attention, memory and judgment, [p. 4] space and time, feelings and will, etc., -- these are especially the problems to the study of which the work of the Harvard Laboratory is devoted. Here lies, no doubt, the future of Experimental Psychology. But our chief desire is to give useful suggestions for establishing and improving psychological laboratories. 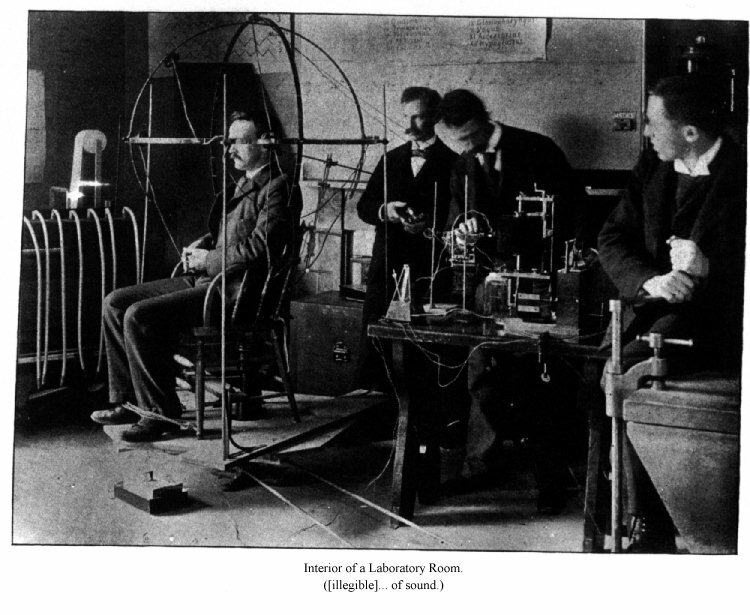 With an increasing recognition that the results of Experimental Psychology are important, not only to psychologists and philosopher, but also to teachers and physicians, there is a growing desire for new laboratories; and we are constantly called upon for information about the most important instruments, their prices, and where they may be obtained. The purpose of this Catalogue is to give such information, and by the classification of instruments according to their use, to secure to every branch of experimental study an adequate representation. Of course, other instruments may be substituted for many of ours, since·Experimental Psychology is at an early stage, where every large laboratory must have an individual character. Too much emphasis cannot, however, be laid on the relative importance of Group IV., that of technical equipment. Appendix B supplies the Catalogue with the addresses of the most reliable manufacturers from whom such instruments may be obtained. And finally, Appendix C gives a list of references to the literature of Experimental Psychology which will be found valuable in active laboratory work. The nature of this pamphlet limits the references to those books and articles which describe the apparatus and methods of psychological experiments. But even within these narrow limits, it has been necessary to refer to only the more important contributions, and to give, even of these, merely general references rather than complete titles; otherwise our Appendix would grow to be a volume. Photograph 1. 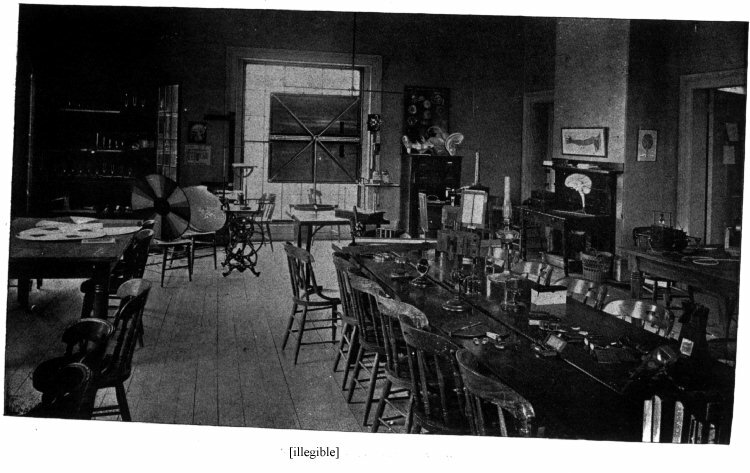 Interior of Laboratory Room. OF THE PHYSICAL BASIS OF MENTAL LIFE. 1. Large wire model, showing the fibres and the cerebral masses. After Aeby, by Buechi, Bern. $90. 2. Large elastic model, showing the course of the nerve-fibres throughout the encephalic mass. After Luys, by Auzoux, Paris. $75. 3. Natural sized clastic model, showing the nerve-fibres in one hemisphere, and the cerebral ganglion masses on the other. After Luys, by Auzoux, Paris. $56. 4. Natural sized clastic model. By Bock-Steger, Leipzig. $9. 5. Large model, showing the convolutions. By Talrich, Paris. $14. 6. Large model, showing horizontal section. By Talrich, Paris. $14. 7. Large model, seen from below. By Talrich, Paris. 8. Large model of corpus callosum, seen from below. By Talrich, Paris. $14. 9. Large model, showing median section. By Talrich, Paris. $14. 10. Large clastic model of cerebellum and spinal cord. By Auzoux, Paris. $25. 11. Vertical section of head. By Bock-Steger, Leipzig. $6. 12· Model of the head of adult male, brain exposed on the side. By Casciani, Dublin. $5.50. 14. Model of the head of an aged man, brain exposed on the side By Casciani, Dublin. $5.50. 15. Model of the head of elderly female, insane, brain exposed on the side. By Casciani, Dublin. $5.50. 16. Set of fourteen wax models, showing the development of the fœtal brain. After Ecker, by Ziegler, Freiburg. $14. 17. Model of the head of a seven months' fœtus, brain exposed on the side. By Casciani, Dublin. $5.50. 18. Model of the head of a child six months old, brain exposed on the side. By Casciani, Dublin. $5.50. 19. Model of the head of a girl, brain exposed on the side. By Casciani, Dublin. $5.50. 20. Collection of human brains in alcohol. 21. Collection of charts, showing sections of the brain, and forty-eight stereoscopic views of the central nervous system. After Debierre and Doumer, by Alcan, Paris. 22. Set of eight wax models, showing the phylogenic development of the brain. After Wiedersheim, by Ziegler, Freiburg. $35. 23. Model of the head of chimpanzee, brain exposed on the side. By Casciani, Dublin. $7.50. 24. Model of the head of orang-utang, brain exposed on the side. By Casciani Dublin. $7.50. 25. Collection of sheep brains in alcohol. 26. Collection of charts showing development of brain, from gymnotus to mammal. 27. Half skull, with the seven first cerebral nerves in wax. By Tramond, Paris. $20. 28. Large clastic model of eye, divided by a vertical section. By Auzoux, Paris. $20. 29. Large clastic model of eye, showing muscles, nerves, vessels, etc. By Auzoux, Paris. $19. 30. Clastic model of human eye. By Bock-Steger, Leipzig. $6.50. 32. Set of nine wax models of the eye, showing the embryological development of the vertebrate eye. After Manz, by Ziegler, Freiburg. $14. 33. Standard eyes for anthropological comparison. After Galton, by Cambr. Scient. Instr. Co. $11.50. 34. Large elastic model of the ear, showing the internal, middle, and external ear. By Auzoux, Paris. $50. 35. Large elastic model of the ear, showing especially the internal ear. By Brendel, Berlin. $19. 36. Large collection of histological preparations for microscopical study of brain, sense-organs, nerves, and muscles. By Bourgogne, Paris; Queen, Philadelphia; Kloenne and Müller, Berlin, etc. 37. Collection of charts and large photographs in frame, showing anatomy of nerves and sense-organs. $20. 38. Artificial eye, consisting of glass water-tank, lenses, etc. After Kuehne, by Jung, Heidelberg. $16. 41. Ophthalmotrope, demonstrating movements of the eye, and action of the different muscles which produce them. After Ruete, by Kohl, Chemnitz. $22. 42. Model showing mechanism of the drum and bones of the ear. After Helmholtz, by Jung, Heidelberg. $11. II. APPARATUS FOR STUDYING THE: SENSATIONS. 43. The harmonical, furnishing 24 over-tones of C (66) and the first 16 of c (132). After Ellis, by Moore, London. $65. 44. One large tuning-fork, giving from 32 to 48 vibrations. By Koenig, Paris. $60. 45. Set of twelve tuning-forks, with resonance-boxes, Ut2. Ut3, Mi3, Sol3, La3, Ut4, Mi4, Sol4, seventh harmonic of Ut2, Ut5, Re5, Mi5. By Koenig, Paris. $104. 46. One extra Ut4 tuning-fork and one Ut4 + four vibrations, with resonance-boxes. By Koenig, Paris. $14. 47. Five tuning-forks, with resonators, tuned to the characteristic notes of the vowels. After Helmholtz, by Koenig, Paris. 48. Bow for vibrating tuning-forks. By Queen, Philadelphia. $4. 49. Series of ten resonators. After Helmholtz, by Koenig, Paris. $35. 50. Series of twenty-two steel cylinders, giving notes from Ut7, to Ut10 by stroke of steel hammer. By Koenig, Paris. $30. 51. Apparatus for testing the appreciation of difference in musical pitch. After Galton, by Camb. Scient. Instr. Co. $50. 52. Large bellows, with regulator and wind-chest for twelve pipes. By Koenig, Paris. $130. 53. Nine open wooden pipes, from Ut2 to Ut3, to be used with the organ-bellows. The Ut2 duplicated. By Koenig, Paris. $30. 54. Eight stopped pipes, giving the scale from Ut3 to Ut4,. By Koenig, Paris. $12. 55. Apparatus for studying the non-musical intervals of sounds between 128 and 256 vibrations (Tonmesser). By Appunn, Hanau. $40. 56. Apparatus for studying the non-musical intervals of sounds between 256 and 512 vibrations. By Appunn, Hanau. $75. 57. Revolving mirror, manometric capsule, etc., for analyzing manometric flames. By Koenig, Paris. $12. 58. Whistle for determining highest limit of sound, after Galton. By Koenig, Paris. $22. 59. Differential sonometer, with weights. After Marloye, by Koenig. Paris. $22. 60. Toothed wheel. After Savart, by Queen, Philadelphia. $6. Photograph 3. 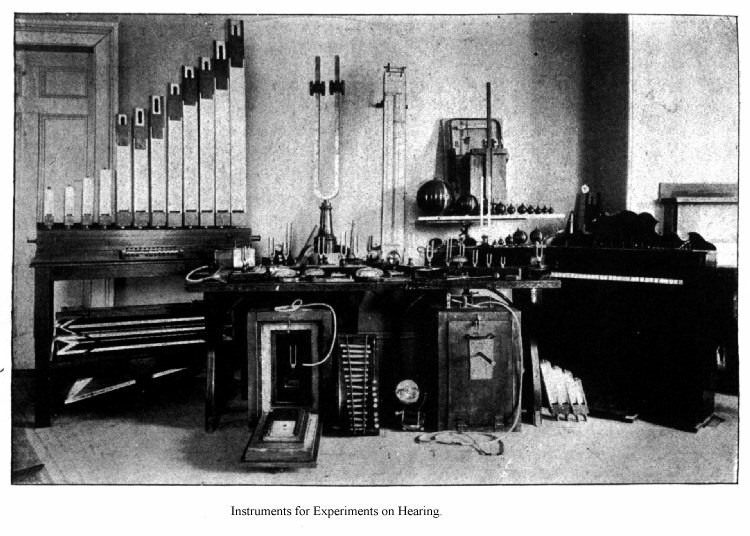 Instruments for Experiments on Hearing. Photograph 4. 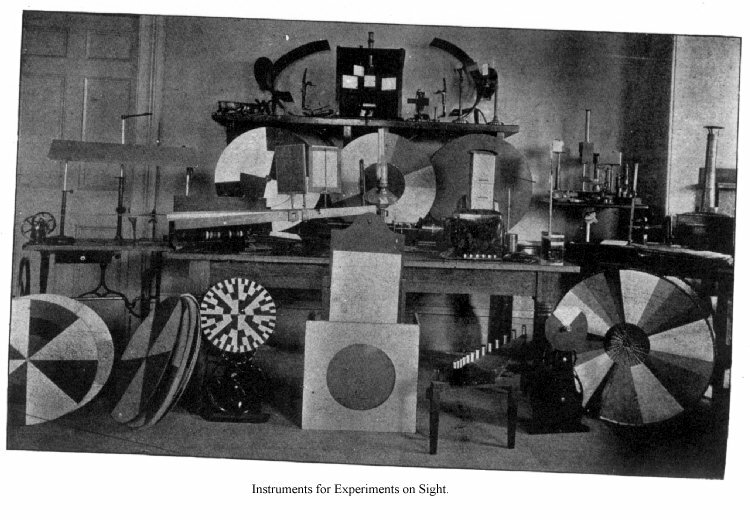 Instruments for Experiments on Sight. 62. Eight electric bells of various pitches, from 6 to 16 ctm. in diameterl. By Brock, Cambridge. $19. 63. Two electric bells, single stroke. By Brock, Cambridge. $6. 64. Snappers for giving different qualities of short noises, three telephones, pistols, etc. 65. Large electric phonometer, producing noises of various intensities. After Münsterberg. By Elbs, Freiburg. 66. Small phonometer. Made in the Laboratory. 67. Two large boxes for tuning-folks impervious to sound, with ear appliances, etc. After Gilman, made in Cambridge. $25. I. B. Models of ear, etc. III. A. Registering tuning-forks, etc. III. B. Instruments for localization of sound. Time-sense. 68. Large color-mixer, with horizontal rotating disks, connected with foot-machine. Six dozen colored-paper disks. After Hering, by Rothe, Prag. $30. 70. Color-mixer, adjustable under rotation. After Pillsbury, by Bradley, Springfield. 71. Large color-mixer for four disks, two upon each spindle. After Wundt, by Krille, Leipzig. $35. 72. Set of color-disks, 60 ctm. in diameter. By Krille, Leipzig. $8. 73. Color-mixer. After Galton, by Cambr. Scient. Instr. Co. $10. 74. Two color-wheels, with disks, By Milton Bradley Co., Springfield. $20. 75. Newton's disk, 80 ctm. in diameter. By Queen, Philadelphia. $4. 76. Apparatus for mixing colors by mirrors and colored glasses. After Hering, by Rothe, Prag. $17. 77. Apparatus for mixing colors by the combination of colored gelatine papers, After Münsterberg, by Elbs, Freiburg. $20. 78. Three boxes for mixing colors by reflection. Made in the Laboratory. 79. Simultaneous contrast apparatus, with two prisms for binocular or monocular investigation. After Hering, by Rothe, Prag. $10. 81. Instrument for the recombination of parts of the solar spectrum. By Kohl, Chemnitz. $15. 82. Instruments for successive contrast, irradiation, etc. By Kohl, Chemnitz. $6. 83. Apparatus for color after-images. After Hering, by Rothe, Prag. $18. 84. Chromatoskiameter. After Holmgren, by Rose, Upsala. $25. 85. Apparatus for diagnosing color-blindness. After Hering, by Rothe, Prag. $25. 86. Apparatus for appreciation of color. After Galton, by Camr. Scient. Instr. Co. $17.50. 87. Apparatus for testing simulated blindness. After Snellen, by Meyrowitz, New York. $6. 88. Nachet's adjustable trial-frame. By Meyrowitz, New York. $10. 89. Two perimeters. After Landholt and Priestley Smith, by Meyrowitz, New York. $50. 90. Two hundred and fifty perimeter chartls. By Meyrowitz, New York. $5. 91. Apparatus for testing keenness of eyesight. After Galton, by Cambr. Scient. Instr. Co. $26.50. 92. Spectroscope. After Vogel, by Schmidt and Haensch, Berlin. $12. 93. Large glass prism, 15 x 10 ctm. By Queen, Philadelphia. $15. 94. Two smaller mounted prisms. By Duboscq, Paris. $15. 95. Set of spectacles, with concave, convex, cylindrical, prismatic, and colored glasses. By Miller, Boston. $10. 96. Excelsior lantern. By Queen, Philadelphia. $54. 97. Magic lantern. Stereopticon screens. By Elbs, Freiburg. 98. Gorham's kaleidoscope top. By Griffin, London. $6.50. 99. Micrometric shutter for studying minute fields of color. Münsterberg. By Elbs, Freiburg. $42. 100. Magnifying mirror. By Lloyd, Boston. $3. 101. Set of Geissler tubes. $6. 102. Thirty plates colored glass. By Redding, Baird, and Co. Boston. $20. 103. Prismatic spectrum charts in frame. By Prang, Boston. $5. I. B. Models of eye, etc. III. A. Apparatus for optical reaction time. III. B. Apparatus for study of visual space-perception, etc. III. C. Apparatus for study of optical recognition, discrimination, æsthetics. C. DERMAL AND MUSCULAR SENSATIONS. 101. Kinesimeter. After Hall, byPfeifer, Baltimore. $81. 105. Tube for hot and cold spots. $2.50. 106. Six aesthesiometric compasses. $12. 107. Set of two hundred arrangements for studying number and extension of skin sensations. After Nichols; made in the Laboratory. 108. Instrument for studying the fusion of touch sensations. After Krohn; made in Cambridge. l09. Apparatus for testing appreciation of weight. After Galton, by Cambr. Scient. Instr. Co. $25. 110. Dynamometer for showing Strength of hands. By Verdin, Paris. $7. 111. Salter's dynamometer for showing strength of hands. By Camb. Scient. Instr. Co. $4. 112. Salter's dynamometer for showing strength of arms. By Cambr. Scient. Instr. Co. $4. III. A. Instrument for touch reaction, etc. III. B. Apparatus for tactual space, movement presentations, etc. III. 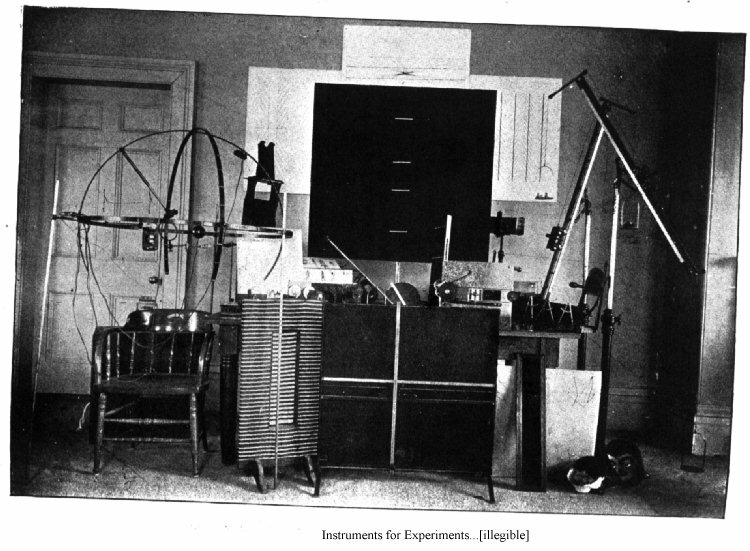 APPARATUS FOR STUDYING THE HIGHER PSYCHICAL PROCESSES. A. TIME MEASUREMENT OF MENTAL ACTS. 113. Kymograph. After Ludwig, by Cambr. Scient. Instr. Co. $175. 114. Revolving drum. By Verdin, Paris. $60. 115. Two electric signals, one with tuning-fork attachment. After Deprez, by Verdin, Paris. $30. 116. Two tambours for giving signals upon revolving drum. After Marey, by Verdin, Paris. $14. 117. Two connected tambours. $25. 118. Large demonstration-drums, etc. Made in Cambridge. 119. Electrical tuning-fork of one hundred vibrations. By Koenig, Paris. $21. 120. Electrical tuning-fork of fifty vibrations. By Verdin, Paris. $20. 121. Electrical tuning-fork of ten vibrations. By Verdin, Paris. $30. 122. Registering tuning-fork of fifty vibrations, to be set in motion by a Bunsen aspirator. After Ewald, by Maier, Strassburg. $20. 125. Four simple writing tuning-forks. by Kohl, Chemnitz. $15. 124. Metronome, with electrical connection. After Kronecker, by Verdin, Paris. $9. 125. Hipp's chronoscope, measuring one-thousandth part of a second. By Peyer, Favarger & Co., Neufchatel. $71. 126. Control hammer for Hipp's chronoscope. After Wundt, by Krille, Leipzig. $60. 127. Pendulum instrument for giving rhythmical electric contacts and short optical impressions, and for controlling the chronoscope. After Münsterberg, by Elbs, Freiburg. Photograph 6. 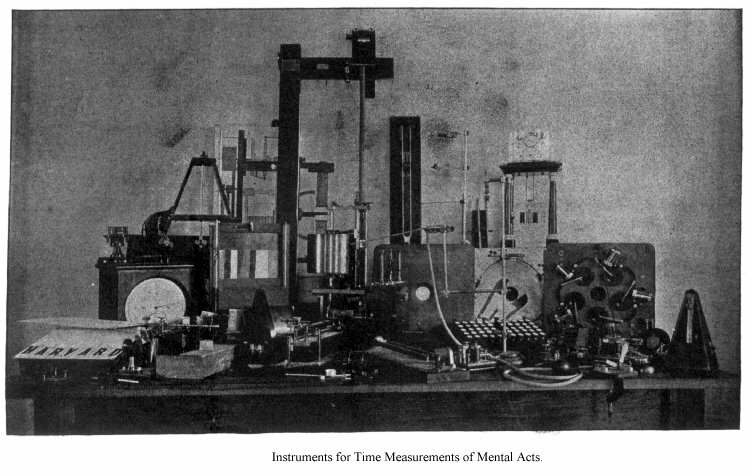 Instruments for time measurements of mental acts. 120. Clock measuring the hundredth part of a second, with spring and mechanical starter. After Münsterberg, by Elbs, Freiburg. $60. 131. Reaction-time pendulum. After Galton, by Cambr. Scient. Instr. Co. $18. 133. Reaction-time instrument with vibrating arm and smoked slide. After Exner, by Heinitz, Wien. $8. 134. Large demonstration-chronoscope. After Wundt, by Krille, Leipzig. $100. 135. Flash-light instrument, with electric contact. After Bowditch, by Marie, Boston. 13C. Drop-window for the sudden exposure of colors, numbers, etc. By Elbs, Freiburg. $6. 137. Touch-reaction instrument, with twenty different stimuli. By Elbs, Freiburg. $20. 138. Ins. Two telegraph keys, with sounder. $5.70. 139. Five simple telegraph keys. $10. 140. Electric key. After Ewald, by Maier, Strassburgp. $2. 141. Electric key. After Dubois-Reymond, by Cambr. Scient. Instr. Co. &7.50. 142. Electric key, combined with writing signal. Made in the Laboratory. 143. Reaction-key with fifty buttons. After Münsterberg, by Elbs, Freiburg. $10. 144. Chain-reaction instrument for ten persons, each instrument provided with five electric keys and five frames. After Münsterberg, by Elbs, Freiburp. $200. 145. Set of six hundred disks for the chain-reaction instrument. By Cooperat. Assoc., Cambridge, Mass. $16. II. A, B, C. Instruments for optical, acoustical, tactual stimulation. 146. Instrument for investigating the power of the eye to compare lengths (Augenmassapparat). After Münsterberg, by Elbs, Freiburg. $20. 147. Instrument for the optical reproduction of given lengths. After Münsterberg, by Elbs, Freiburg. $10. 148. Instrument for estimating the divisions of a line. After Galton. by Cambr. Scient. Instr. Co. $4. 149. Instrument for estimating angular divisions. After Galton, by Cambr. Scient. Instr. Co. $10. 150. Wheatstone's stereoscope, with slides. By Queen, Philadelphia. $6.25. 151. Five hand-stereoscopes. By Lloyd, Boston. $10. 152. Stereoscopic pictures. After Kroll, by Voss, Hamburg; and other sets. 153. Twenty tin tubes, and pasteboard tubes for stereoscopic purposes. 154. Pseudoscope. After Ewald, by Maier, Strassburg. $25. 155. Pseudoscope. ByElliott, London. $5. 156. Two human concave masks, illustrating optical illusions. 157. Apparatus for showing appreciation of distance by convergence. Made in the Laboratory. 158. Haploscope. Made in the Laboratory. 159. Set of charts, with optical illusions. 161. Stroboscopic rotating disk, with Geissler's tube. After Poggedorff, by Kohl, Chemnitz. $11. 162. Artificial waterfall. After Bowditch; made in the Laboratory. 163. Two large instruments for studying the muscle-sensation, tactual space, and the presentations of movement. After Münsterberg, by Elbs, Freiburg. $80. 164. Apparatus for studying the perception of the position of the body. After Aubert; made in Cambridge. 166. Apparatus with electric contacts for studying the time-sense. After Schumann, by Diederichs, Goettingen. $45. 167. Sound-hammer for experiments on time-sense. By Krille, Leipzig. $4.50. 169. Set of twenty-four instruments for studying space-sense in coordinated movements of both arms. After Bowditch, by Marie, Boston. 170. Set of balls of the same weight, but of different sizes. By Marie, Boston. II. A, B, C. Instruments for optical, acoustical, tactual impressions, micrometric shutter, etc. C. ASSOCIATION, ATTENTION, DISCRIMINATION, MEMORY, FEELINGS, EMOTIONS, WILL, ETC. 171. Material for studies in association (four hundred photographs, picture-books, large printed numbers, letters, words, etc.). 172. Eight sets of arrangements for studies ill memory. Made in the Laboratory. 173. Instrument for studies in association and memory. After Münsterberg, by Elbs, Freiburg. 174. Instrument for studying the complication of perceptions. After Wundt, by Krille, Leipzig. $38. 175. Instrument for the study of the attention, two simultaneous impressions being given to disparate senses. After A. H. Pierce; made in the Laboratory. 176. Instantaneous shutter for association experiments. By Elbs, Freiburg. $7. 177. Rotary chair for the study of dizziness, etc. After Münsterberg, by Elbs, Freiburg. $40. 178. Small instrument for studying the movements during the emotions. By Elbs, Freiburg. $9. 179. Large instrument for the study of æsthetic forms and proportions. After Münsterberg and Witmer, by Elbs, Freiburg. $100. 180. Six sets of arrangements for the study of æsthetic combinations of color·. Made in the Laboratory. 181. Cercle chromatique de Charles Henry. $8. 183. Ponograph. After Mosso, by Verdin, Paris. $20. 184. Myograph. After Marey, by Verdin, Paris. $12. 186. Instrument for registering the pulse of the two carotids at once. After Marey, by Verdin, Paris. $15. 187. Pneumograph. After Marey, by Verdin, Paris. $15. 188. Instrument for studying the time-relations of voluntary movements. After Loeb; made in the Laboratory. 189. Apparatus for studying unconscious movements. $4. 190. Hypnoscope. After Luys. $13. Photograph 7. 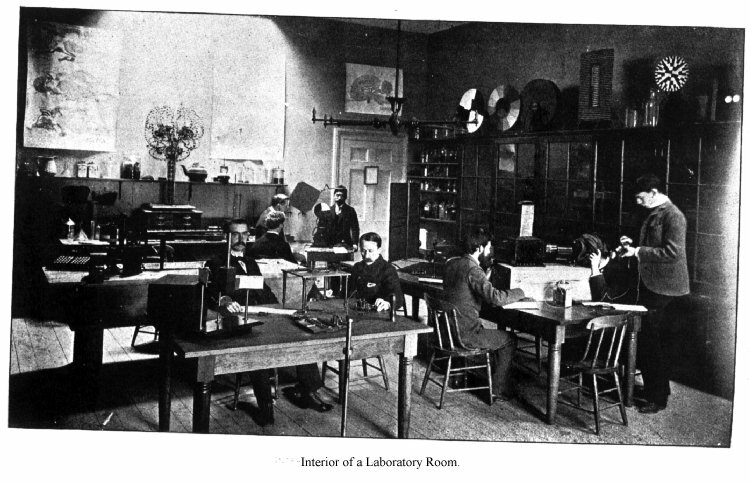 Interior of a Laboratory Room. A. OPTICAL AND MEASURING INSTRUMENTS. 191. Two Heliostats. By Kohl, Chemnitz. $40. 192. Photometer. After Bunsen and Toepler, by Kohl, Chemnitz. $12. 193. Microscope, with adjustment by graduated micrometer screw, Abbé condenser, iris diaphragm, cylinder diaphragms, double nose-piece, objectives, 2, 4, 7, 9, eye-pieces, i, iii, iv. By Leitz, Weimar. $96. 194. Microscope. By Hart & Praz, Paris. $60. 196. Photographic camera. By Lerchours, Paris. $50. 197. Large and small reading-glasses. $5. 198. Cardboard and gelatine paper of various colors, two hundred sheets of colored paper, colored crayons, etc. By Milton Bradley Co., Springfield; Prang, Boston, etc. 199. Large and small finely graded thermometers, six ordinary thermometers. $8. 200. Three aërometers, measuring tubes for liquids, pipettes, etc. $4. 201. Mathematical drawing instruments, protractors, etc. $3. 202. Apothecary scale, with weights. By Whitall & Tatum, Boston. $12. 203. Balance scale, spring letter-balance, etc. By Fairbanks, St. Johnsbury. $12. 204. Two sets of brass weights. By Kohl, Chemnitz. $13. 205. Instrument for showing the variations of error from the average. After Bowditch, by Marie, Boston. II. B. Spectroscope, magic-lanterns, etc. III. A. Chronoscopes, registering tuning-forks, etc. 206. Eighteen Leclanche cells (Gonda). $18. 207. Three Grenet cells. $13.50. 208. Sixteen Bunsen cells. $40. 209. Six Grove cells. $10.50. 210. Large induction coil for producing sparks. By Kohl, Chemnitz. $50. 211. Induction coil. After Dubois-Reymond, by Krüger, Berlin. $30. 212. Electro-magnetic machine. By Smith, New York. $17. 213. Small induction coil, with handles. By Elbs, Freiburg. $5. 215. Rheochords. By Elbs, Freiburg; by Krille, Leipzig, etc. $10. 216. Galvanometer, with mirror, etc. After Nobili, by Kohl, Chemnitz. $18. 218. Commutator for four currents. By Marie, Boston. 219. Two rocking mercury commutators. By Cambr. Scient. Instr. Co. $8.70. 220. Large set of electrodes, electrical connections, and wires (copper, platina, brass, and iron; coarse and flexible; insulated, etc.). III. A. Electric chronoscopes, keys, tuning-forks, reactors, etc. IV. C. Mercury, acids, etc. C. SURGICAL, MECHANICAL, CHEMICAL OUTFIT. 221. Surgical outfit (four pairs scissors, seventeen forceps, seventeen scalpels, fifteen probes, six silver probes, set of saws, scissor-pliers[sic], hammers and chisels for dissecting, set of syringes, camel's hair brushes, etc.). 223. Pigeon-holder. After Ewald, by Naier, Strassburg. $5. 224. Arrangement for smoking kymograph papers, and fixings the curves in the shellac bath. Made in the Laboratory. 225. Carpenter's bench, with full set of carpenter's tools (vice, scroll-saw, etc.). $70. 227. Collection of metal stands and rods, etc. 228. Holder for prisms. By Kohl, Chemnitz. $3. 229. Universal holder. By Cambr. Scient. Instr. Co. $10. 230. Glass apparatus (tubes, rods, jars, funnels, etc.). 231. Rubber tubes (from two to twenty-five mm. in diameter), rubber bands, rubber atomizers, etc. 232. Porcelain jars, basins, etc. 233. Brass and copper sheets, nails, screws, hooks, pins, corks, straw, wadding, boards, boxes, cloth, linen, etc. 234. Chemical apparatus and reagents. $15. 235. Jar of mercury. $7. 236. Blast lamp and bellows for glass blowing. $9. 238. Set of soldering tools. $3. 240. Edison mimeograph, copying-machine. $20.25. ORIGINAL RESEARCHES CONDUCTED IN THE HARVARD LABORATORY DURING THE YEAR 1892-1893. 1. A psychometric investigation of the fusion of sensations of touch. Two persons. 2. The influence of auditory, olfactory, tactual, and other sense-stimuli upon the quality of very feeble visual sensations. Five persons. 3. An investigation of the relations between the sense of position and sensations of movement. Seven persons. 4. The localization of two or more equal or unequal simultaneous sounds. Five persons. 5. An investigation concerning the means by which we are able to judge of the distance of sounds. Three persons. 6. The origin and nature of perception of form and extension in the sense of touch. Two persons. 7. An investigation of the phenomena of dizziness in general, and especially its relations to the localization of sound. Five persons. 8. The influence of the order of the parts of a visual presentation on the time necessary for its recognition. Seven persons. 9. Study of the visual perception of rotation. Two persons. 10. The genesis of perception of number, especially in the sense of touch. Four persons. 11. The influence of the content on the judgment of the length of a time-interval, filled and limited by visual impressions. Ten persons. 13. A study of the comparative influence of vividness, repetition, and recency on the process of association. Nine persons. 14. The time-relations of the association of isolated presentations as compared with the association of presentations combined into sentences. Four persons. 15. The conditions under which dissociation of simultaneous perceptions may occur. Six persons. 16. The influence of attention and distraction in changing the intensity of visual, auditory, muscular, dermal, and other sensations. Eight persons. 17. The discrimination-time of lines of different lengths, -- a psychometric study of the psychophysic law by the method of chain-reaction. Ten persons. 18. Time-relations of negative judgments. Three persons. 19. A study of elementary æsthetic forms and proportions with respect to the influence of content and position, more especially with reference to our sense of symmetry and compensation in the relation between intensity and interval. Six persons. 20. The æsthetic value of combinations of colors, and its dependence upon their positions and relative sizes. Seven persons. 21. The influence of sense-stimuli upon voluntary muscular action. Two persons. 22. The influence of muscular fatigue on the psychical processes, especially on the perception of just perceivable differences. Eight persons. THE EQUIPMENT OF PSYCHOLOGICAL LABORATORIES, IN ALPHABETICAL ORDER. ANTON APPUNN. Hanau a. M., Germany, 12 Nurnbergerstrasse. Acoust. instr. AUZOUX. Paris, 2 Rue Antoine-Dubois. Anatom. mod. (after Luys, etc.). BALTZAR. Leipzig, 14 Karolinenstrasse. Physiol. instr. (after Ludwig, etc.). MILTON BRADLEY CO. Springfield, Mass. Color. pap., etc. R. BRENDEL. Berlin, W., 56 Ansbecherstrasse. Anatom. mod. J. D. BROWN. Camden, N.J., 618 North Sixth Street. Psycholog, instr. (after Cattell, Witmer, etc.). JOHN BROWNING. London, W. C., 63 Strand. Opt. instr. BRUNNER. Paris, 59 Rue de Vaugirard. Opt.instr. F. BUECHI. Bern, Switzcrland, 34 Spitalgasse. Anat. mod. (After Aeby.). THE CAMBRIDGE SCIENTIFIC INSTRUMENT COMPANY. Cambridge, England, St. Tibb's Row. Opt., acoust., electr. instr., kymographs, anthropometric app. (after Galton, etc.). L. CASCIANI & SON. Dublin, 32 Wellington Quay. Anat. mod. (after Cunningham, etc.). CLAY & TORBENSEN. Camden, N·J.,117 Front Street. Instr. of precision. ALVAN CLARK & SONS. Cambridge, Mass., 186 Brookline Street. Lenses. COLLIN. Paris, 6 Rue de l'École de Médecine. Surgical outfit, etc. LUIGO CORINO. Torino, Ttaly. 18 Via Po. Instrum. of precis. (after Mosso). DENNISON. Boston, 18 Franklin Street. Letters, numbers, etc. ÉMILE DEYROLLE. Paris, 46 Rue du Bac. Anat. mod. P. DOERFFEL. Berlin, 46 Unter den Linden. Opt. instr. THEOD. ET ALBERT DUBOSCQ. Paris, 11 Rue des Fossées Saint-Jacques. Opt., acoust. instr. M. TH. EDELMANN, München. Phys. and physiol. instr. EIMER & AMEND. New York, 205 Third Avenue. Chemicals. HERMANN ELBS. Freiburg i. B., Germany, 17 Friedrichstrasse. Psycholog. instr. (after Münsterberg). ELLIOTT BROS. London, 449 Strand. Electr. instr. E. & T. FAIRBANKS & CO. St. Johnsbury, Vermont. Scales, etc. C. GERHARDT. Bonn, Germany, 90 Bornheimerstrasse. Chem., phys. app. E. S. GREELEY & CO. New York, 5 Dey Street. Electr. app. W. GROVES. London, W., 89 Bolsover Street, Portland Place. Electr. app. W. GRUNOW, JR. New York, 204 East 43d Street. Scient. Instr. on order. HARVEY &; PEAK. London, W. C., 56 Charing Cross Road. Opt. instr., etc. O. HIMLER. Berlin, S., 9 Brandenburgstrasse. Opt. instr. W. A. HIRSCHMANN. Berlin, S., 54 Kommandantenstrasse. Electr. med. instr. FRANZ HUGERSHOFF. Leipzig, Turnerstrasse. Phys. and chem. app. R. JUNG. Heidelberg, Germany. Physiol. instr. (after Helmholtz, Kuehne, Foerster, etc.). D. B. KAGENAAR. Utrecht, Holland. Opt. and physiol. instr. (after Donders, Snellen, Engelmann). RUD. KOENIG, Ph. D. Paris, 27 Quai d'Anjou. Acoust. instr. (after Helmholtz, etc.). MAX KOHL. Chemnitz i. S., Germany. Physic. app. RICHARD KNY & CO. New York, 17 Park Place. Anat. mod. import. CARL KRILLE. Leipzig, 8 Schulstrasse. Psychol. instr. (after Wundt). H. R. LINDENLAUB. Schmiedefeld in Thüringen, Germany. Glass instr., thermom., etc. J. F. LUHME & Co. (ROHRBECK). Berlin, N. W., 24 Karlstrasse. Glass instr. T. H.·MaCALLISTER. New York, 49 Nassau Street. Optical instr. F. MAJER. Strassburg i. Els., Germany, 10 Kraemergrasse. Physiol. instr. (after Ewald). J. T. MAYFIELD. London, E. C., 41 Queen Victoria Street. Electr. app. J. F. MEYER. Zurich, Switzerland. Physiol. instr. MEYROWITZ BROS. New York, 295 Fourth Avenue. Opt. instr. MOORE & MOORE. London, E. C., 105 Bishopsgate Street. Organs, etc. ROB. MUENCKE. Berlin, N. W., 58 Luisenstrasse. Phys. chem. app. PATRICK & CARTER. Philadelphia, Pa., 125 South Second Street. Electr. app. WILH. PETZOLD. Leipzig, 13 Bairischestrasse. Physiol. instr. (after v. Kries). PEYER, FAVARGER, & CO. (successor to Hipp). Neufchatel, Switzerland. Chronoscopes, etc. ASAM PFEIFER. Baltimore, Johns Hopkins University. Psychol. instr. (after St. Hall). PRANG EDUCATIONAL CO. Boston, 7 Park Street. Colored pap. JAMES W. QUEEN & CO. Philadelphia, Pa., 1010 Chestnut Street. Optic., acoust. instr., anatom. mod., etc. REINIGER, GEBBERT, & SCHALL. Erlangren, Bayern, Germany, 3 Schlossplatz. Electr. app. J. L. ROSE. Upsala. Physiol. instr. (after Holmgren). RUD. ROTHE. Prag-Wenzelsbad, Austria. Kymographs, opt. instr. (after Hering). FR. RUNNE. Basel, Switzerland, 41 Steinenthorstrasse. Chronomet. FRANZ SCHMIDT & HAENSCH. Berlin, S., 4 Stallschreiberstrasse. Opt. instr. JULES TALRICH. Paris, 97 Boulevard St. Germain. Anat.mod. MAISON VASSEUR, TRAMOND. Paris, 9 Rue de l'École de Médec. Anat. mod. CHARLES VERDIN. Paris, 7 Rue Linné. Physiol. instr. (after Marey, etc.). RUD. WEISKER. Leipzig. Anat. mod. (after Leuckart, His, etc.). WHITALL, TATUM, & CO. Philadelphia, Pa., 410 Race Street. Glassware. WHITE. Glasgow, 78 Union Street. Electr. app. ADOLF. ZIEGLER, M. D. Freiburg i. B., Germany, Hermannstrasse. Anat. mod. (after Ecker, Wiedersheim, Manz). L. ZIMMERMANN. Heidelberg, Hauptstrasse. Opt. elect. instr. (after Helmholtz, etc.). PSYCHOLOGICAL EXPERIMENTS ON NORMAL ADULT SUBJECTS. ANGELL, J. R. Amer. Journ. of Psychol., 4. ANGELL, FRANK. Philos. Stud., 7. AUBERT, HERM. Physiologie der Netzhaut, 1865. Grundzüige der physiol. Optik. Graefe-Saemisch. II. Physiol. Stud. über d. Orientirung. Unters. z. Naturl. d. Menschen, 4, 5. Zeitschr. f. Psychologie, etc. AXENFELD, D. Bull. d. Acad. med. Roma,1887, 1888. BARTENSTEIN, JUL. Diss. Freiburg i. B., 1889. BEAUNIS, H. Rev. Philos. 20, etc. Cpts. rend. de, 1'Acad. d. Sc., 96, 100, etc. Arch. de Physiol., 1889. BELL, A. G. Amer. Journ. of Otology, 1880. BERGER, G. O. Philos. Stud., 3, 5. BERTELS, ARV. DiSS. Dorpat, 1889. BEZOLD, W. v. Zeitschr. f. Biologie, 1, 2, etc. Sitz.-ber. d. Bayr. Akad. M. Ph. Cl., 2, 15, etc. BINET, ALR. Rev. Philos., 1887, 1890, etc. BLOCH, A. M. Arch. de Physiol., 1875, 1891. Cpts. rend. d. 1'Acad. d. Sc., 1883. Journ. d. 1'Anat. et d. la Physiol., 1884, etc. BLIX. Zeitschr. f. Biologie, 1884, etc. BOAS, FRANZ. Arch. f. d. ges. Physiol., 26, 27, 28, etc. BONNIER, P. Thèse de Paris, 1890. BOWDITCH, H. P. Boston Med. a. Surg. Journ., 1880. Journ. Of Physiol., 3, 6, 11, etc. Science, 80. BREUER. Jarb. d. Ges. d. Aerzte. CViell, 1874, 1875. BRODHUN, EUG. Diss., Berlin, 1887. Zeitschr. f. Psychol., 3. Sitz.-ber. d. Berl. Akad., 1888. BRÜCKE, ERNST. Sitz.-ber. d. Wien. Akad. M. N. Cl., 1864, 1865, 1878, 1880, 1885, etc. BUCCOLA, G. La legge del tempo nei fenomeni del pensiero, 1883, etc. BURNHAM, W. H. Amer. Journ. of Psychol., 2. CALKINS, M. W. Amer. Journ. of Psych., 5. CAMERER. Zeitschr. f. Biologie, 6. CATTELL, JAMES MCKEEN. Philos. Stud., 2, 3. Mind, 13, 14, etc. Public. of the Univ. of Pennsylv. Phil. Ser., etc. CHARPENTIER, AUG. Arch. de physiol. norm. et path., 1877, 1883, 1891. Cpts. rend. d. 1'Acad. d. Sc., 1881, 1882, 1884, 1885. La persistance des impressions rétiniennes, 1891, etc. CHODIN. Arch. f. Ophthalmol., 23. CREMER, MAX. Diss. Wuerzburg, 1887. CRUM BROWN. Journ. of Anat. a. Physiol., 8. CZERMAK, JOH. Unters. z. Naturl. d. Menschen, 1, 5, etc. Sitz.-ber. d. Wien. Akad. M. N. Cl., 12, 15, 17, 24, 43, 66, etc. DELABARRE, EDM. BURKE. Diss. Freiburg i. B., 1891. Rev. Philos., 1832. Amer. Journ. of Psychol., 2. DELAGE, YVES. Arch. de Zool. exper., 1886. DELBOEUF, J. Bull. d. l'Acad. Roy. d. Belg., II. 19, 20. Rev. Philos., 3, 4, 12, etc. Étude psychophysique, 1873. Éléments de psychophys., 1883, etc. DESSOIR, MAX. Arch. f. Anat. u. Physiol., 1892. DIETL, M. J. Arch. f. d. ges. Physiol., 16. DIETZE, GEORG. Philos. Stud., 2. DOBROWOLSKY, W. Arch. f. d. ges. Physiol., 10, 12, 24. Arch. f. Ophthalmol., 18, etc. DOCQ, A. J. Mém. cour. d. 1'Acad. roy. Bruss., 34. DOHRN. Zeitschr. f. rat. Med., 10. DONDERS, F. C. Arch. f. Anat. u. Physiol., 1868. Journ. d. l'anat. et physiol., 1868. Arch. f. d. hollaend. Beitr. z. Natur- u. Heilk., 1, etc. DRESSLAR, F. B. Amer. Journ. of Psychol., 4. DUCHENNE. Mécanisme d. l. physiogn. hum., 1862. DUMREICHER, OTTO. Diss. Strassburg, l889. EBBINGHAUS, HERM. Sitz.-ber. d. Berl. Akad., 1887. Zeitschr. f. Psychol., 1-5. Das Gedächtnis, 1885. EJNER, MICH. Diss. Dorpat, 1889. ESTEL, V. Philos. Stud., 2. EWALD, R·. Arch. f. d. ges. Physiol., 44, etc. Nervus octavus, 1892. etc. EXNER, SIGM. Arch. f. d. ges. Physiol., 1, 3, 7, 8, 11, 13, 20, 28. Sitz.-ber. d. Wien. Akad. M. N. Cl., 58, 65, 72. Zeitschr. f. Psychologie, 1. Hermann's Handbuch d. Physiologie, 2, etc. FALK, MAX. Diss. Dorpat, l890. FÉRÉ, CN. Rev. philos., 1889, etc. FECHNER, GUST. Abhandlgn. d. Sächs. Ges. d. Wiss., 1858, 1859, 1861, 1871, 1884. Ber. d. Sächs. Ges. d. Wiss., 1857, 1858, 1860, 1861, 1864. Philos. Stud., 3, 4. Zeitschr. f. Biol., 21. Elemente der Psychophysik, 1860. Zu Sachen der Psychophysik, 1877. Revision, 1882, etc. FICK, A. Hermann's Handbuch der Physiol., 1, 3. Arch. f. Anat. u. Physiol., 1853, 1863, etc. Arch. f. d. ges. Physiol., 47, 50, etc. FICK, E. Arch. f. Ophthalmol., 36. FISCHER, OTTO. Philos. Stud., 3. FISCHER, R. Arch. f. Ophthalmol., 37. FLEISCHL, E. v. Sitz.-ber. d. Wien. Akad., 1882. Medic. Jahrb., 1882, etc. FRANCK, C. Diss. Koenigsberg, 1889. FRANKLIN, CHR. L. Amer. Journ. of Psychol., 1. Zeitschr. f. Psychol., 4. FRIEDRICH, MAX. Philos. Stud., 1. FUNKE, O. Hermann's Handbuch d. Physiol., 3, etc. GAD, J. Zeitschr. f. klin. Medicin, 20. Biolog. Centlablatt, 7, etc. GALTON, FR. Inquiries into Human Faculty, 1883. Mind, 5, etc. Brain, 1879, etc. GILMAN, B. J. Amer. Journ. of Psychol., 4. GLAN, P. Arch. f. d. ges. Physiologie, 24. GLASS, R. Philos. Stud., 4. GLEY, EUG. Arch. d. physiol., 1881. Rev. philos., 1885. Congrès internat. d. Psych., Paris, etc. GOLDSCHEIDER, ALF. Diss. Berlin, 1881. Arch. f. Anat. u. Physiol., 1885, 1886. Arch. f. Psychiatrie, 1887. Monatsh. f. prakt. Dermat., 1884. Berl. klin. Wochenschrift, 1890, etc. GRAEFE, ALF. Arch. f. Ophthalmol., 37, etc. GRIFFITHS, W. Journ. of Physiol., 9. HALK, STANLEY. Mind, 3, 8, 10. Arch. f. Anat. u. Physiol., 1879. Proc. of the Amer. Acad. of Arts and Sc., 13. Amer Journ. of Psychol., 1-5. HANKEL, W. Ber. d. Sächs. Ges. d. Wiss., 1866, etc. HELMHOLTZ, H. v. Lehre von den Tonempfindungen, III. A, 1870. Hannbucb der Physiol. Optik, II. 1886-1893. Arch. f. anat. u. Physiol., 1850, etc. Annalen der Physik u. Chemie, 79, etc. Zeitschr. f. Psychol., 1, 2, 3, etc. HENRY, CH. Rev. scientif., 1892, etc. HERING, EWALD. Beitraege zur Physiologie, 1861-64. Archiv. F. Anat. u. Physiol., 1864, 1865. Sitz.-ber. d. Wien. Akad. M. N. Cl., 66, 68, 69, 70, 72, 78. Arch. f. Ophthamol., 35, 36, 37. Arch. f. d. ges. Physiol., 47, 49. Zeitschr. f. Psychol., 1. Hermann's Handbuch der Physiol., 3, etc. HERMANN, L. Arch. f. d. ges. Physiol., 49, etc. HESS, CARL. Arch. F. d. ges. Physiol., 49. Arch. F. Ophthalmol., 35, 36, etc. HEYMANS. Internat. Congr.·of E:xper. Psychol., London, 1892. HIGIER, C. Diss. Dorpat, 1890. HILLEBRAND, F Sitz.-ber. d. Wien. Akad. M. N. Cl. 98. Zeitschr. f. Psychol., 5. HIRSCH, AD. Unters. z. Naturl. d. Menschen, 9, 10. Bull. D. l. soc. de sc. nat. à Neufchatel, etc. HOLMGREN, FR. Farbeublindheit, 1878. Unters. a. d. Heidelb. Physiol. Instit., 2, 3. Skand. Arch. f. Physiol. 1, etc. HOWELL, W. H. Stud. f. t. Biol. Lab. of the Johns Hopkins Univers., 4. JAMES. W. Principles of Psychology, 1890. Mind 12, etc. Amer Journ. of Otology, 4, etc. JASTROW. Jos. Science, 1886. Mind, 11, etc. Amer. Journ. of Psycholog., 1-4. Time Relations of Mental Phenomena, 1890. etc. JAVAL, E: Journ. d. l'anat. et d. l. phys., 1882, etc. KIRSCHMANN, A. Philos. Stud., 5, 6, 7. 8. KLUG. Arch. f. Ophthalm., 21. Arb.d.Physiol. Anstalt. Z. Leipzig, 1876. KOENIG, A. Sitz.-ber. d. Berl, nkad., 1886, 1887,1888. Zeitschr. f. Psychol., 4. Beitr. z. Psych. u. Physiol. d. Sinnesorg., 1891. KOLLERT, JUL. Philos. Stud., 1. KRAEPELIN, E.. Philos. Stud., 1, 2, 6. Biolog. Centralblatt. 1. Zeitschr. f. Psychiatrie, 46. Beeinflussung einf. psych. Vorg. durch Arzneimittel, 1892. KRIES, J. v. Arch. f. Anat. u. Physiol., 1877-80, 1885, 1886. Vierteljahrsschr. f. wiss. Philos., 6, 11. Zeitschr. f. Psychol., 1, 3. Beitr. z. Psych. u. Physiol. d. Sinnesorg., 1891, etc. KROHN, W. O. Journ. of Nerv. a. Mental Diseases, 1893. Amer. Journ. of Psychol., 5. KUEHNE, W. Unters. a. d. Heidelb. Physiol. institut, etc. KUELOE, O. Philos. Stud., 6, 7, 8. Arch. f. d. Gesch. d. Philos., 1893. KUNDT. Annalen d. Phys. u. Chem., 120. LADD, GEORGE. Physiological Psychology, 1889. LANGE, LUDW. Philos. Stud., 4. LANGE, NIC. Philos. Stud., 4. LANGLOIS, P. Rev. Philos., 1890. LEHMANN, A. Philos. Stud., 3, 5, 7. Arch. f. d. ges. Physiol., 36. Gefühlsleben, 1892. LEITZMANN, HERM. Philos. Stud., 4. LIPPS, TH. Grundtatsachen des Seelenlebens, 1883. Psychologische Studien, 1885. Zeitschr. f. Psychol., l, 3. Beitr. z. Psych. u. Phys. d. Sinn, 1891. LOEB, J. Arch.f. d. ges. Physiol., 40. LOMBARD, W. P. Amer. Journ. of Psychol., 1, 3. Journ. of Physiol., 13. LORENZ, CARL. Philos. Stud., 6. LORENZ, GUSTAV. Philos. Stud., 2. LUFT, ED. Philos. Stud., 4. MACH, E. Lehre von d. Bewegungsempfindungen, 1875. Analyse der Empfindungen, 1886. Sitz.-ber. d. Wien. Akad. M. N. Cl., 43, 48, 51, 54, 69, etc. MAGGIORA. Arch. f. d. ges. Physiol., 33. 1890, etc. MAREY, E. J. Physlologie éxperimentale, 1875-80. MARTIUS, GOETZ. Philos. Stud., 5, 6, 7. Ziele u. Ergebnisse d. exper. Psychol., 1888. MEHNER, MAX. Philos. Stud., 2. MENDENHALL. Amer. Journ. of Arts. a. Sc., 1871. MERKELL JUL. Philos. Stud., 4, 5. MESSER. Ann. d. Phys. u. Chemie, 157. MOLDENHAUER, W. Philos. Stud., 1. MOSSO, A. Sulle circulazione del snague nel cervello dell' uomo, 1880. La paura. La fatica, 1891. Arch. ita. d. biol., etc. MÜLLER, G. E. Diss. Leipzig, 1871. Zur Grunglgung der Psychophysik, 1879. Archiv f. d. ges. Physiol., 19, 45. MÜNSTERBERG, HUGO. Beiträge zur exper. Psycnologle, 1888-92 Aufgaben u. Methoden der Psychologie, 1891. Reallexikon der Medicin. Propaedeutik, 1892, etc. Zeitschr. f. Psychologie, 1, etc. NAGEL, A. Sehen mit zwei Augen, 1861. Graefe-Saemisch. Handb. d. Augenheilk., 6. NOERR, CARL. Zeitschr. f. Biologie, 15. NEIGLICK, HJALMAR. Philos. Stud., 4. NICHOLS, HERB. Amer. Journ. of Psychol., 3-4. OEHRN, AXEL. Diss. Dorpat, 1889. OEHRWALL. Skandin. Arch. f. Physiol., 1890. OSTERMANN, H. Diss. Wuerzburg, l888. PANETH, J. Centralblatt f. Physiol., 4. PESCHEL, MAX. Arch. f. d. ges. Physiol., 21. PFAUNDLER. Sitz.-ber. d. Wien. Akad. M. N. Cl., 76. PIERCE, A. H. Amer. Journ. of Psychol., 4. PLATEAU, J. Mém. d. 1'Acad. roy., Bruss., 42, 43, 45. Lull. d. 1'Acad. roy., Bruss., 33. Annalen d. Physik u. Chemie, 150, etc. POLLITZER, S. Journ. of Physiol., 5. PREYER, W. Grenzen der Tonwahrnehmung, 1876. Akust. Untersuchungen, 1879. Natur. u. Menschenleben, 1885. Gedankenlesen, 1886. Arch. f. d. ges. Physiol., 1, 25, etc. Sitz.-ber. d. Jen. Ges. f. Med., 1881. Annalen d. Phys. u. 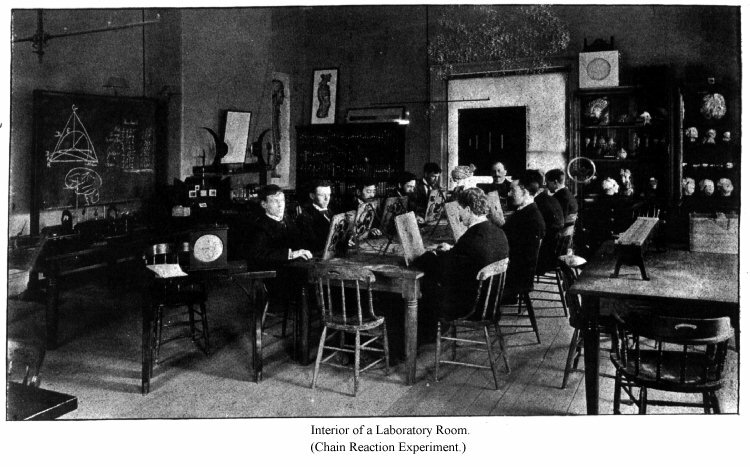 Chem., 1889. Zeitschr. f. Psychol., etc. PUTNAM, J. J. Journ. of Phys. 2. RÉMOND, A, La durée dea actes psych. l. plus simples. 1888. RENÉ, A. Gaz. des hôpitaux, 1882. Lanc. franc., 1882. RIBOT, TH. Rev. philos. 1876, 1879, 1880, 1891. La psychologie allemande, 1885, etc. RICHARDSON, B. W. Proc. Roy. Soc., London, 1879. RICHET, CH. Recherches sur la sensibilité. Rev. philos. 4, 9, 18, 21, 25. Cpts. Rend. d. l'Acad. d. sc., 1879, etc. RIEGER, K. Exper. Unters. über d. Willenstätigkeit, 1885. ROLLETT, A. Sitz.-ber. d. Wien. Akad. M. N. Cl. 42, 55. Arch. f. d. ges. Physiol., 49. ROSENSTIEHL, A. Cpts. rend. d. 1'Acad. sc., 93, 94. SACHS, MOR. Arch. f. Ophthalmol., 36. SANFORD, E. C. Amer. Journ. of Psychol., 1-5. SCHADOW, G. Arch. f. d. ges. Physiol., 19. SCHAEFER, E. A. Journ. of Physiol., 7. SCHAEFER, K. L. Diss. Jena, 1889. Zeitschr. f. Psychol., 1. SCHIFF, M. Unters. z. Naturl. d. Menschen, 6, 10, etc. SCHIRMER, O. Arch. f. Ophthalmol., 36. SCHISCHMANOW, IWAN. Philos. Stud., 5. SCHMERLER, BRUNO. Philos. Stud., 1. SCHUMANN, F. Nach. d. Ges. d. Wiss, Goettingen, 1889. Zeitschr. f. Psychologie, 1, 2, 4. SCHUSTER, A. Proc. of the London Roy. Soc., 48. SCHWARNER, R. Diss. Marburg, l890. SCHWARZ, O. Arch. f. Psychiatrie, 21. SCRIPTURE, E. W. Philos. Stud., 6, 7. SERGI, G. Psicologia, 1891. Zeitschr. f. Psychol., 3. SHORE, L. F., Journ. of Physiol., 13. SNELLEN, H. Graefe-Saemisch. Handb. d. Augrenheilk., 3. STARKE, PAUL. Philos. Stud., 3. STEVENS, W. L. Philos. Magaz. 1882. Amer. Journ. of Sc. 1881, 1882. STEVENS, L. T. Mind. 11. STRICKER, S. Bewegungsvorstellungen, 1882. Association der Vorstellungen, 1883. Medic. Jahrb. Wien, 1881. Sitz.-ber. d. Wien. Akad. M. N. Cl., 76, etc. STROSCHEIN, E. Diss. Jena, 1885. STUMPF, C. Ursprung der Raumvorstellung, 1873. Toupsychologrie, 1890. Zeitschr. f. Psychol., 1, 2, etc. SULLY, T. Human Mind, 1892. Mind, 3, 4, 5, etc. Brain, 1890, etc. SZILI, A. Arch. f. Anat. u. Physiol., 1891. Zeitschr. f. Psychol., 3. TANZI, EUG. Rivista di filosofia scientif., 10. Rivista di Freniatria. 1890, etc. THANNHOFER. Arch. f. Anat. u. Physiol., 1891. TIGERSTEDT, R. Zeitschr. f. Biologie, 19. Mitt. v. Physiol. Lab., Stockholm, 1886. TITCHENER, E. B. Philos Stud. 8. TRAUTSCHOLDT, M. Philos. Stud., 1. UHTHOFF, W. Arch. f. Ophthalmol., 36. Zeitschr. f. Psychol., 1. URBARTSCHITSCH, V. Arch. f. d. ges. Physiol., 24, 25, 27, 31. VIERORDT, K. v. Zeitsinn, 1868. Physiologie, 1877. Schall-u. Tonstärke, 1885. Arch. f. d. ges. Physiol., 2. Zeitschr. f. Biologie, 6, 12, 18, etc. VINTSCHGAU, M. v. Arch. f. d. ges. Physiol., 10, 12, 14, 19, 20, 22, 30, 33, 37. Hermann's Handb. d. Physiol., 3, etc. VOLKMANN, A. W. Physiol. Unters. im Gebiet d. Optik, 1863. Wagner's Handwoerterb. d. Physiol., etc. WALLENBERG, G. Arch.f. d. ges. Physiol., 48. WALLER, A. D. British Med. Journ., 1886. Proc. of the Physiol. Soc., 1891. Brain, 1891, 1892. WARNER. F. K. Journ. of Physiol., 4. WEBER, E. H. Wagner's Handwoerterb. d. Physiol. Ber. d. Saechs. Ges. d. Wiss., 1848, 1849, 1852, etc. WOLFE, H. K. Philos. Stud., 3. WUNDT, WILH. Beitr. z. Theorie der Sinneswahrn., 1862. Physiologie, 1878. Essays, 1885. Grundzüge der Physiolog. Psychologie, III., 1887. Vorles. über Menschen- u. Tierseele, 1892. Philos. Stud., 1-8. ZIEHEN, TH. Physiolog. Psychol. 1891. ZWAARDEMAAKER. Weekbl. v. h. Nederl. Tijdschr. voor Geneesk., 1890, etc. See: Beard, Beaunis, Berger, Bérillon, Bernheim, Binet, Charcot, Delbœuf, Dessoir, Forel, Gruetzner, Gurney, Hack, Tuke, Heidenhain, James, Janet, Krafft-Ebing, Lehmann, Liébault, Luys, Magnin, Moll, Myers, Ochorowicz, Preyer, Ribot, Richet, Schrenck-Notzing, Seppilli, Tamburini, Wetterstrand, etc. See: Bernhardt, Binet, Bourdon, Buccola, Charcot, Erb, Eulenburg, Féré, Foerster, Goldscheider, James, Janet, Jerusalem, Kraepelin, Kreidl, Kussmaul, Leyden, Lombroso, [p. 32] Naunyn, Nothnagel, Obersteiner, Pick, Rémond, Ribot, Richet, Rieger, Rumpf, Sollier, Tschisch, Urbantschitsch, Wilbrandt, Ziehen, etc. See: Baldwin, Binet, Bolton, Bryan, Genzmer, Grabs, Hall, Kroner, Kussmaul, Merkel, Passy, Pérez, Preyer, Queyrat, Raehlmann, Sigismund, etc. See: Binet, Czermak, Dahl, Darwin, Delbœuf, Dubois, Engelmann, Exner, Forel, Graber, Grant Allen, Handl, Hensen, Kollmann, Landois, Loeb, Lubbock, Plateau, Plath, Preyer, Riccardi, Rieger, Romanes, Schneider, Verworn, etc. See: Bastian, Bechterew, Brown-Séquard, Christiani, Curschmann, Danilewski, Exner, Ferrier, Flourens, François-Franck, Goltz, Gotch, Hermann, Herzen, Hitzig, Horsley, Lussana, Mitchell, Munk, Nothnagel, Paneth, Schaefer, Schiff, Schrader, Soltmann, Soury, Steiner, Vulpian, Waller, etc. See: Aubert, Bernard, Bowditch, Bruecke, Cyon, Ewald, Fick, Foster, Frey, Funke, Gad, Grünhagen, Gscheidlen, Helmholtz, Hensen, Hering, Hermann, Jacquet, Kries, Koenig, Kuehnen, Landois, Langendorf, Ludwig, Marey, Stirling, Vierordt, Wundt, etc. See: Appleton, Arnoldt, Bouton, Brewster, Bunsen, Carhart, Eisenlohr, Frick, Gerland, Helmholtz, Kohlrausch, O. Lehmann, Müller-Pouillet, Niaudet, Pellat, Steinheil, [p. 33] Stewart, Weinhold, Wiedemann, Whiting, Wright, Wüllner, etc. ; Annalen der Phgsik und Chemie; Zeitschrift für Instrumentenkunde; Praktische Physik, etc. See : Abbé, Bachmann, Balfour, Beale, Bowmen, Carpenter, Dippel, Duval, Edinger, Ehrlich, Exner, Flechsig, Fol, Frey, Gaule, Gerlach, Golgi, Gudden, Heurck, Hogg, Koelliker, Krause, Kühne, Latteux, Leydig, Meynert, Naegeli, Obersteiner, Pelletan, Phin, Ramon y Cajal, Ranvier, Retzius, Richardson, Schultze, Schwalbe, Schwendener, Seiler, Smith, Stilling, Stricker, Thannhofer, Toldt, Tuerck, Tyson, Weigert, etc. See : Aeby, Cunningham, Donaldson, Eckert, Exner, Flechsig, His, Luys, Kühne, Manz, Wiedersheim, etc. See: Bain, Baldwin, Ballet, Bastian, Beaunis, Bernard, Bernstein, Binet, Bonniot, Bouiller, Brown-Séquard, Calderwood, Carpenter, Carus, Castelein, Charcot, Christiani, Cornelius, Domrich, Donaldson, Exner, Féré, Ferrier, Hack Tuke, Helmholtz, Hering. Herzen, Hoeffding, Horwicz, Huschke, James, Kussmaul, Ladd, Lange, Lewes, A. Lehmann, Lotze, Marshall, Maudsley, Meynert, Mosso, Muensterberg, Munk, Nichols, Nothnagel, Paulhan, Piderit, Ribot, Richet, Schiff, Schultze, Sergi, Spamer, Sully, Wundt, Ziehen, etc. See: Arréat. Bleuler, Bolton, Bryan, Calkins, Cattell, Fechner, Galton, Grueber, Hall, Heerwagen, Héricourt, James, Jastrow, Kraepelin, Lombroso, Marillier, Muensterberg, Myers, Oehrn, Ribot, Richet, Schrenck-Notzing, etc. See: Index-Catalogue of the Library of the Surgeon-General's office. U.S.A.; Zeitschrift für Psychologie u. Physiol. der Sinn; Centralblatt für Physiologie; American Journal of Psychology; Philosophische Monatshefte; Centralblatt für Nervenheilkunde; Philosophisches Jahrbuch; Journal of Comparat. Neurology; Index Medicus; Journ. of Mental Science; Hermann's Handbuch der Physiologie; Hofmann-Schwalbe's Jahresberichte, etc. ; Buechting (pathol. psych., physiol. ); Dessoir (hypnot. ); Elb (neurolog. ); Gayley-Scott (psych. aesth.) ; Graesse (hist. of psych. ); Hall (pedagog. psych. ); Helmholtz (opt. ); Jastrow (time meas. ); Krohn (chromaesth. ); Lubbock (sense of animals); Mann (patholog. psych. ); Plateau (opt. ); Schwalbe (anat. of sense-org. ); Ueberweg (hist. of psych. ); Vallée (bibliog. Of bibliogs. ); Volkmann (general psych. ), etc.